Blacker Courtyard has a habitual tendency to accumulate bizarre things. From half-finished weekend projects to Interhovse and Ditch Day remnants to the spoils of dumpster diving adventures, there are always interesting gadgets to play with. … yeah, I don’t know either. But life around here is certainly interesting. We have something like 45 Moles staying over the summer, plus a number of summer students from other schools that come to do SURFs here. So the Hovse is quite lively during the evenings and weekends! It’s pretty great to get a lot of interesting Caltech people together without any problem sets or exams to worry about. Things can get pretty crazy during term, so it is nice to kick back during the summer. That being said, it’s not just crazy during term because of the schoolwork. As a Hovse we have a lot of really awesome things that happen during the year. 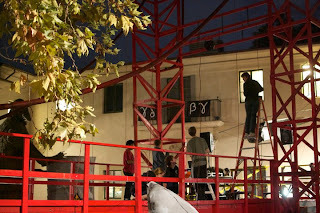 Allow me to acquaint you with one of our most exciting traditions… Interhovse! 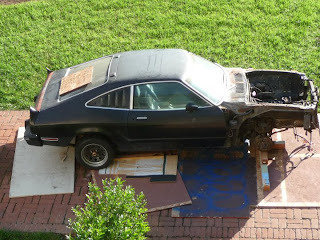 … and a 1976 Ford Cobra II Mustang that we got for free off Craigslist, carried into the courtyard and subsequently crashed into a tree! We also painted a really cool floor-to-ceiling mural in the lounge for the party. 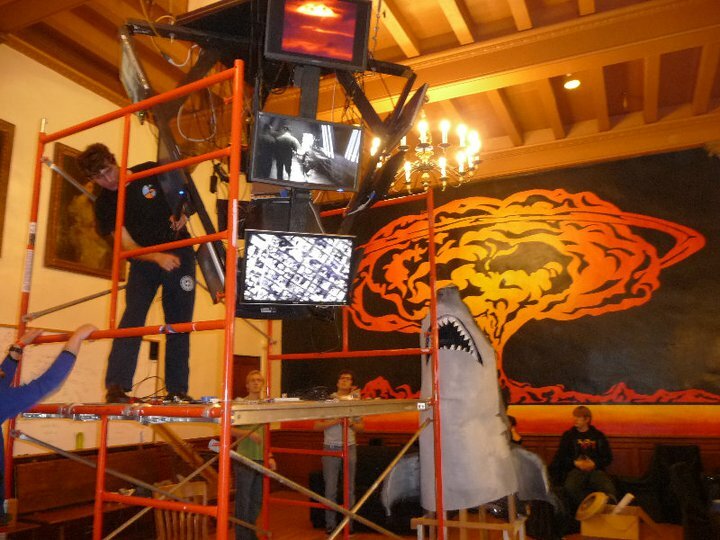 In this picture you can also see a giant shark that we made for the courtyard and construction of a conical panel of monitors that went in the lounge for our evil villain lair. All in all it was a pretty ridiculous party. We also built Little Interhovse third term this year, which was a bit more small scale. Our theme was “Eccentric Millionaire Mansion” — we constructed a second story in the lounge with curved ballroom staircases. One part of the ground floor was turned into a secret room accessible only through a rotating bookcase. One of the more interesting pieces for the party was a paper mache dragon head (creepy taxidermy eyes and all!) that was mounted at the top of our ballroom staircases. 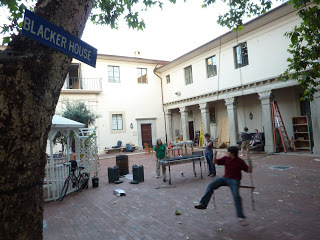 The courtyard was a classy garden party with paper lanterns and a homemade gazebo. It also ended up being a great party. 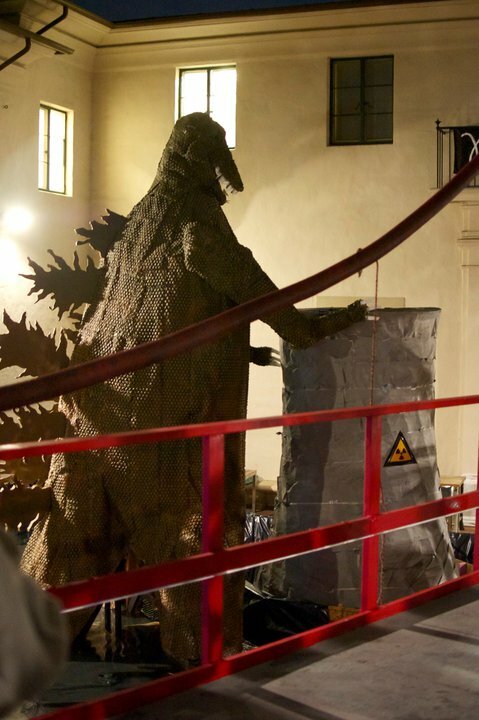 We’ve had a lot of neat Interhovse themes while I’ve been a student here — in addition to the two this year, I’ve also helped build a Doctor Seuss themed party and Epic Interhovse, which was based on the Siege of Troy, complete with a two-story wooden Trojan horse. Building Interhovse is great fun because you get to work with the whole Hovse, and watch unbelievably cool projects come into being. What will we build next year? I don’t know, you’ll have to come see! … to the Utmost Institution of Gracious Living, the Church and Hovse of Blacker! (The two being one and inseparable.) We are one of the eight student residences here at Caltech, located south of the Olive Walk, which makes us a Hovse (very different from those Houses of the blustery north!). You might hear members of Blacker Hovse referred to as Moles. Some say this is a reference to old-timey Caltech slang, others say it refers to our proclivity for exploring steam tunnels and other nether regions of campus. In any event, I should probably introduce myself… my name is Marissa! I am the secretary of Blacker Hovse, and I’ll be curating this blog for the summer. It will hopefully serve as a resource for all you inquisitive prefrosh to get to know us a little better. I’ll be posting stories, pictures and videos submitted by members of the Hovse, and making some posts of my own about our summertime goings-on.